A Formula One Grand Prix event spans a weekend. It begins with two free practice sessions on Friday (except in Monaco, where Friday practices are moved to Thursday), and one free practice on Saturday. In the event of a major incident or unsafe weather conditions, the race may be red-flagged. Then: If under 3 laps have been completed when the red flag is displayed, the race is restarted from original grid positions. Those who drive at blinding speeds and cut across each other on wafer-thin margins can still be daunted, once they ride a ‘tuk-tuk’ (read, and auto-rickshaw) in Delhi. McLaren Mercedes champions drivers Lewis Hamilton and Jenson Button may have beaten them all, but they still are in a little bit of awe of the Delhi auto drivers. The Formula One drivers today had a first brush with the track at the brand new Buddh International Circuit here and found it “challenging” although it was quite dusty in the morning when they first saw it. The 5.14 km-long track with 16 corners will hosts India’s first-ever Formula One Grand Prix on Sunday with practice sessions starting tomorrow morning. Talented Azhar Ali finally got a maiden Test century as Pakistan piled pressure on Sri Lanka on the second day of the second Test at Dubai cricket Stadium here today. A three-figure score had eluded the 26-year-old right-hander in the last 14 Tests but he finally reached the mark in the closing stages to guide Pakistan to a dominating 281-4, gaining a lead of 42 over Sri Lankan first innings of 239. Pankaj Dharmani, who had captained Punjab cricket team in Ranji Trophy for the last five seasons, has announced to retire from first class cricket. He is the highest run scorer for Punjab. Starting his career as a wicketkeeper batsman in 1993, he added several feathers to his cap during his glorious career of 18 years. India's ace shuttler Saina Nehwal battled her heart out before going down to Xuerui Li of China in straight-games to crash out of the French Open Super Series at Paris today. It was a disastrous day for India at Paris as Ajay Jayaram and Commonwealth Games gold medallist pair of Jwala Gutta and Ashwini Ponnappa too suffered defeats to draw curtains on the country's campaign at the event. The current qualifying system was adopted for the 2006 season. Known as "knock-out" qualifying, it is split into three periods (or rounds). In each period, drivers run qualifying laps to attempt to advance to the next period, running as many laps as they wish, with the slowest drivers being "knocked out" at the end of the period and their grid positions set, based on their best lap times. Cars are eliminated in this manner until 10 cars remain eligible to attempt to qualify for pole position in the third and final period. This lap is often referred to as the formation lap, as the cars lap in formation with no overtaking (although a driver who makes a mistake may regain lost ground provided he has not fallen to the back of the field). The warm-up lap allows drivers to check the condition of the track and their car, gives the tyres a chance to get some heat in them to get some much-needed traction, and gives the pit crews time to clear themselves and their equipment from the grid. Once all the cars have formed on the grid, a light system above the track indicates the start of the race: five red lights are illuminated at intervals of one second; they are all then extinguished simultaneously after an unspecified time (typically less than 3 seconds) to signal the start of the race. 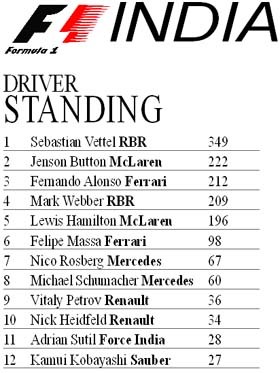 Under normal circumstances the winner of the race is the first driver to cross the finish line having completed a set number of laps, which added together should give a distance of approximately 305 km (190 mi) (260 km (160 mi) for Monaco). As of 2011 the race director in Formula One is Charlie Whiting. This role involves him generally managing the logistics of each F1 Grand Prix, inspecting cars in Parc fermé before a race, enforcing FIA rules and controlling the lights which start each race. In the event of an incident that risks the safety of competitors or trackside race marshals, race officials may choose to deploy the safety car. This in effect suspends the race, with drivers following the safety car around the track at its speed in race order, with overtaking not permitted. In the event of a major incident or unsafe weather conditions, the race may be red-flagged. Then: If under 3 laps have been completed when the red flag is displayed, the race is restarted from original grid positions. All drivers may restart, provided their car is in a fit state to do so. If between 3 laps and 75% of the race distance have been completed, the race may be restarted once it is safe to do so, maintaining the race order at the time of the red flag. 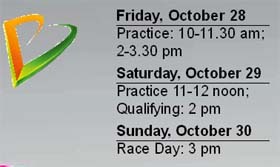 The two-hour time limit still applies however the clock stops when the race is suspended and restarts when it resumes. 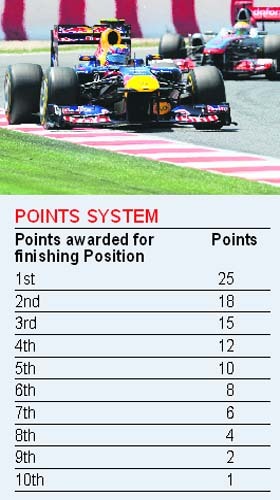 If more than 75% of the race distance has been completed then the race is (often but not always) terminated and the race result counted back to the second last completed lap before the red flag. 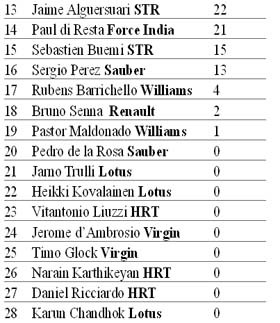 Indicates to drivers that the session has ended. During practice and qualifying sessions it is waved at the allotted time, during the race it is shown first to the winner and then to every car that crosses the line behind him. Indicates danger, such as a stranded car, ahead. A single waved yellow flag warns drivers to slow down, while two waved yellow flags at the same post means that drivers must slow down and be prepared to stop if necessary. Overtaking is prohibited. Warns drivers of a slippery track surface, usually due to oil or water. Accompanied by a car number, it warns a driver that he has a mechanical problem and must return to his pit. Accompanied by a car number, it warns of unsporting behaviour. May be followed by a black flag if the driver does not heed the warning. Warns a driver that he is about to be lapped and to let the faster car overtake. Pass three blue flags without complying and the driver risks being penalised. Blue lights are also displayed at the end of the pit lane when the pit exit is open and a car on track is approaching. Accompanied by a car number, it directs a driver to return to his pit and is most often used to signal to the driver that he has been excluded from the race. All clear. The driver has passed the potential danger point and prohibitions imposed by yellow flags have been lifted. Warns of a slow moving vehicle on track. Those who drive at blinding speeds and cut across each other on wafer-thin margins can still be daunted, once they ride a ‘tuk-tuk’ (read, and auto-rickshaw) in Delhi. McLaren Mercedes champions drivers Lewis Hamilton and Jenson Button may have beaten them all, but they still are in a little bit of awe of the Delhi auto drivers. Especially the latter, on his first visit to India. “You sure concentrate when you drive around here,” said the Briton during a promotional event here this evening. 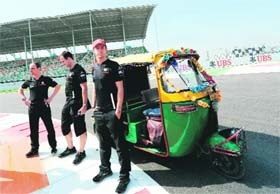 “I think you should utilise the Formula One track for some tuk-tuk races once the Grand Prix is over. I have sure seen some new overtaking techniques on the Delhi roads,” he observed. Button, who got hold of an auto during his trip to the Buddh International Circuit earlier today, was plenty impressed and taken aback by these gizmos. “You really have to lean for the turn, and braking can be quite wobbly,” he added. Such lighter stuff, along with some more serious answers was the essence of the evening, which tended to get a little too stretched. While the two drivers answered a lot of questions about their favourite tracks, turns and drivers, as also the usual ‘culture and food’ issues, they were by and large there to promote a few products and people, as also team sponsors Vodafone. But among all this, some little glimpses of how hard it has been also came out. 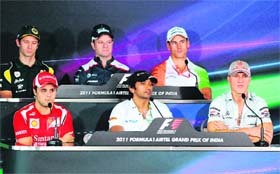 While both he and Button had good words for the Indian drivers, they politely reminded all that this was a different league. Adrian Sutil, the driver of the home team, Sahara Force India, was first to speak on the track. “Quite good job on the circuit really. I went around the circuit this morning and it all looked finished. Looks very interesting lay-out wise. It was still very dusty I have to say, quite dirty, so we will have to see how it is for tomorrow morning. But hopefully it is going to be a great event,” he said. Williams driver Rubens Barrichello gave a thumbs up to the facility. “I have also felt that the track is quite good. They have done a super job in a short period of time. We are going to go out tomorrow but like any new circuit, there should be some dirt on it and some dust, but that’s fairly normal. I am enjoying what I have seen so far,” he said. Ali, the only bright spot from last year's fixing-marred tour of England, put on a 94-run stand for the fourth wicket with skipper Misbah-ul Haq (40 not out) and 117 for the third wicket with Younis Khan (55) to lift his team. In first class cricket, he scored 9,312 at an average of 50.06. Pankaj has 26 centuries and 42 half centuries to his credit with the highest score of 305 not out. He in seventh wicket partnership with Bhupender Singh Junior added 460 runs with his individual contribution of unbeaten 202 against Delhi in the semifinal Ranji Trophy match, which is a world record. His performance in one day cricket is equally impressive. Scoring 3,211 runs, he has an average of 39.64 with 23 half centuries in his bag in his fifteen-year-long career. As a wicketkeeper, he sent 140 batsmen back to pavilion. His excellence as a cricketer bought him in the eyes of the selectors of the Indian cricket team in the year 1996. Though he was included in the Indian squad, he could hardly make a dent in the limited opportunities offered to him. He was the member of playing eleven only for one international. Fourth seed Saina lost 18-21, 29-30 to Li in a 48-minute gruelling women's single match to crash out of the second round for the second time in the last two weeks.